Advertisers spends big money perfecting the art of wordsmithing ads to trick you. Just take a look a the image to the right. Read it to yourself. What do you think it says? "I love Paris in the Springtime" right? Wrong! See the extra "the"? It really says "I love Paris in the the Springtime." Your ad fooled you. Advertisers rely on this type of illusion all the time. 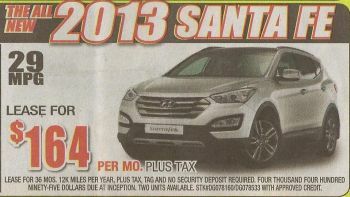 Car dealers are very tricky and misleading when it comes to advertising. You really have to pay attention to all of the fine print. I don't know why it is legal for them to put these legal statements in such a small font and displayed for such a short period of time, that no human can possibly read it. On this page, I'll show you some typical ads so you can see what to look out for. Of course, they play these same games with the microscopic print at the bottom of their TV and internet ads and the almost in-comprehensible babbling disclaimers in their radio ads. "We'll Get You Out Of Your Current Lease No Matter How Much You Owe!" "We'll Pay Off Your Loan No Matter How Much You Owe!" "We'll Give You $4,000 For Any Trade-In!" "Don't Make A $5,000 Mistake!" In the examples above, the dealer is not doing you any favors, they want you to get a vehicle from them at full MSRP. They also want your trade-in so they can give you $4,000 below market value and resell it for a higher price. 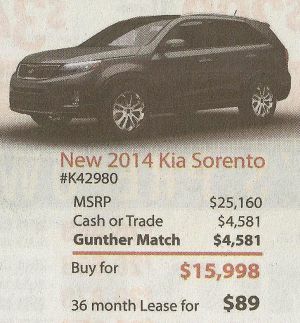 Sometimes an ad can make you think that trading in a vehicle relieves you of your loan or lease obligation. It does not! This important fact gets many buyers into trouble. You are actually taking on increased debt when you thought you were dropping one debt for another. They lied to you in their ad, they are not doing you any favors. They are piling on more debt. It's a very clever trick, but now you're onto them. Next time you hear those ads, you'll know what they're up to. The ads should be worded "We'll get you out of your current vehicle, then roll what you owe plus penalties into your new automobile purchase so you can pay off 2 cars!" This is an oldie but goodie. They want to catch your attention and make you think that you can just walk into the dealership, not have to pay any money out of pocket and get financed at a 0% interest. Let's take a look at the fine print which has been magnified. Notice that it says "With Approved Credit to Qualified Buyers." Trust me, very few people will qualify for this deal. Even people with very good credit will not qualify. This rate is reserved for people with the highest credit scores only. You will see this a lot. The dealer will place an ad with a great price. But, if you look closely you will notice that it says "Two Units Available" and lists the stock numbers as shown below. This dealer is more generous than most because usually they will have just one stock number. Sometimes they will only list the stock number and not specify the quantity available. They want to draw you in so the salesperson can tell you that they just sold that specific car but they have others that you will like. Surprise, the ones they have in stock cost more! Take a look at this ad for a lease. It looks pretty innocent, doesn't it? They don't really lie, you will pay $164 a month plus tax. Let's zoom in on the fine print to find out why you shouldn't be fooled by this deal. First, like most lease ads they don't tell you anything about the Cap Cost or the Money Factor so there is no way to know what the "price" is or if you are getting a good financing rate. Now here's my favorite part, it says that $4,495 is due at lease inception (down payment). Notice how they literally spell it out so that you wouldn't notice the dollar sign and be drawn to the amount? Very clever! This ad is a great example because there are several things to look at. The dealer was nice and put them all into one ad for us to study. They are combining a few tactics to make the price look extremely low. 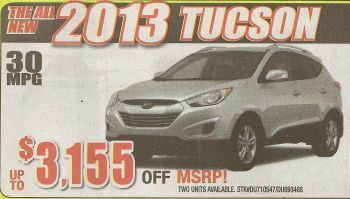 The first thing to notice is that they are counting your down payment or trade-in to reduce the price. Then, they are matching your cash or trade but not both. Again, let's go to the fine print. A few things to notice here. It says "Dealer rebates incentives to the dealer with finance through KMF" which means that they are taking rebates that are supposed to go to you just like we outlined back in chapter 4. Next, notice that the deal expired April 21. This was taken from the April 20th newspaper so by the time you get there it is likely to have expired. Finally, just like one of the earlier ads it says "Offers valid with approved credit on select models." How much do you want to bet that your credit won't be approved or the specific car is already sold? Return to our new car buying guide. Whenever you see the advertised words "as low as," it really means "as much as..."